This is our first post. We’re here! The journey of a thousand miles begins with a single Oy. Wherever you go, there you are. Your luggage is another story. Drink tea and nourish life; with the first sip, joy; with the second sip, satisfaction; with the third sip, peace; with the fourth, a Danish. Accept misfortune as a blessing. Do not wish for perfect health, or a life without problems. What would you talk about? Breathe in. Breathe out. Breathe in. Breathe out. Forget this and attaining Enlightenment will be the least of your problems. Let your mind be as a floating cloud. Let your stillness be as a wooded glen.. And sit up straight. 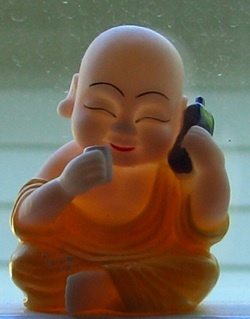 You’ll never meet the Buddha with such rounded shoulders. Deep inside you are ten thousand flowers. Each flower blossoms ten thousand times. Each blossom has ten thousand petals. You might want to see a specialist. Be aware of your body. Be aware of your perceptions. Keep in mind that not every physical sensation is a symptom of a terminal illness. Zen is not easy. It takes effort to attain nothingness. And then what do you have? Bupkis. The Tao does not speak. The Tao does not blame. The Tao does not take sides. The Tao has no expectations. The Tao demands nothing of others. The Tao is not Jewish.